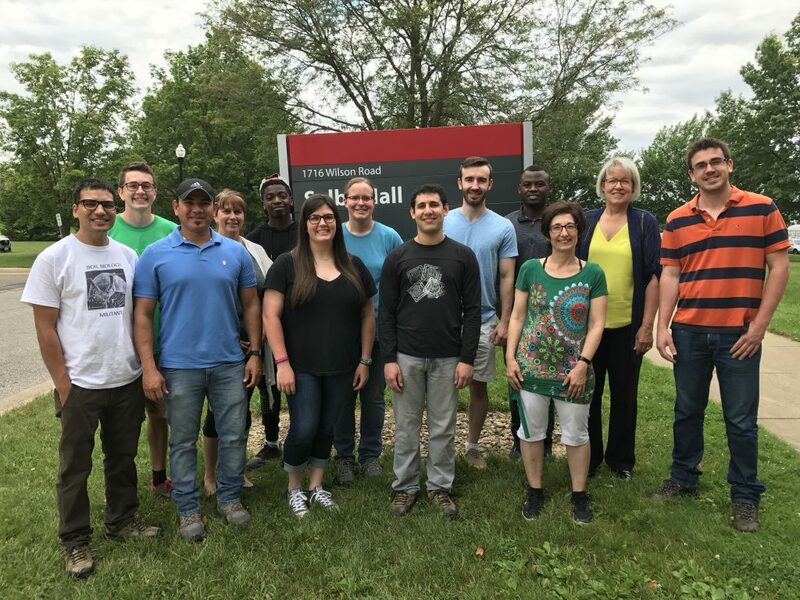 Dr. Sally Miller and her diverse team focus on the biology and management of bacterial, fungal, oomycete, mollicute and nematode diseases of fresh and processing vegetables. Dr. Miller’s program strives to develop sustainable and ecologically friendly management practices that benefit the environment, the grower and consumer. It encompasses management strategies for conventional, transitional and organic production to assist clients in Ohio, nationally and internationally. Through Dr. Miller’s innovative teaching and extension outreach programs she is providing instruction and personal attention so that every client and student can thrive. We invite you to explore our website and contact us if you need support! 2017 Lab Left to right: Ran Khadka (Graduate student), Michael Moodispaw (Undergraduate intern), Jhony Mera (Research Associate), Angie Nanes (Research Assistant), Pierre Paul (Undergraduate intern), Margaret Moodispaw (Undergraduate intern), Anna Testen (Postdoctoral Associate), Andres Sanabria (Graduate student), Loic Deblais (Graduate student), Carlos Saint-Preux (Visiting Scholar), Francesca Rotondo (Research Associate), Sally Miller (Professor and State Extension Specialist), Claudio Vrisman (Graduate student). Not shown: Mynul Islam (Graduate student), Ferdous Elahi (Graduate student).